Whenever a computer running Windows suddenly reboots without displaying any notice or blue or black screen of death, the first thing that is often thought about is a hardware failure. In reality, crashes are often caused by malfunctioning device drivers and kernel modules. In case of a kernel error, computers running Windows do not show a blue or black screen unless they are configured to do so. Instead these systems suddenly reboot without any notice. WhoCrashed shows the drivers that have been crashing your computer with a single click. In most cases it can pinpoint the offending drivers that have been causing misery on your computer system in the past. It does post-mortem crashdump analysis and presents all gathered information in a comprehensible way. In case your system has been crashing because of a hardware failure, WhoCrashed will provide you with guidance to trace the root cause of the problem. Normally, debugging skills and a set of debugging tools are required to do post-mortem crash dump analysis. Using WhoCrashed you do not need any debugging skills to be able to find out what drivers are causing trouble to your computer. It is suggested that you run WhoCrashed. 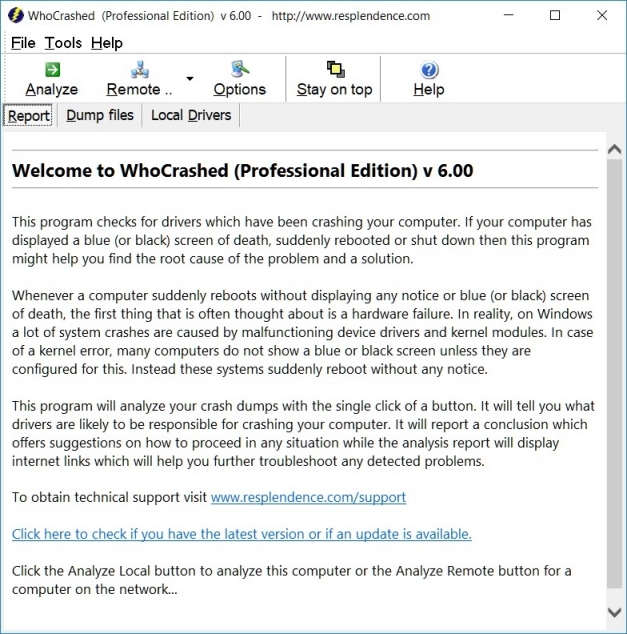 WhoCrashed will analyze the crash dump files available on your computer and create a conclusion. It will inform you about responsible drivers and offer suggestions on how to proceed. If your computer unexpectedly reset or shut down, it is suggested that you run WhoCrashed. WhoCrashed will tell you if crash dumps are enabled on your computer, if not it will offer you suggestions on how to enable them. Click here for more information about sudden resets and shut downs. If your computer crashes during system startup it is suggested that you boot into safe mode and then run WhoCrashed. Check out this article for information on how to boot into safe mode. Note that WhoCrashed cannot always be exactly sure about the root cause of a system crash. Because all kernel modules run in the same address space, any driver or other kernel module can potentially corrupt another. Also, any driver may be able to cause problems to any other driver that runs in the same device stack. This is to say this software is not guaranteed to identify the culprit in every scenario. Page generated on 4/19/2019 12:15:47 AM. Last updated on 2/18/2019 12:33:44 PM.